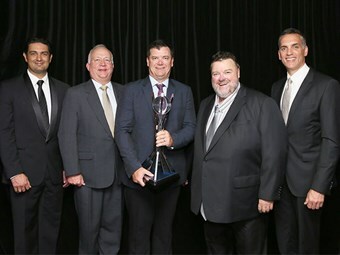 Brown and Hurley Kenworth DAF Yatala crowned top Australian DAF dealership. For a third time, Brown and Hurley Kenworth DAF Yatala in Queensland has been awarded the DAF Dealer of the Year gong. Taking the 2015 award for its market share, technical service and customer support performance, dealer principal Paul Hurley says it is recognition for the dealership’s consistency, having finished in the top four every time over the past seven years. "You run your business to try and serve your customers as best you can and I guess these awards are reward for the staff putting in the hard yards over the year – that’s the way I look at it," Hurley says. "It’s also a reflection of the great support we see from our customers, not only this year but ever since we came to this site." Presenting the gong to Hurley, outgoing managing director at Paccar Australia Mike Dozier says "Brown and Hurley Kenworth DAF Yatala has made a significant contribution to DAF’s collective market share, and the dealership continues to exceed technical workmanship and customer needs." "In 2015 they provided outstanding facilities support for the DAF product," he says. "They achieved their quotas and a high sales turnover for new and old customers, and increased parts growth and warranty claims processing. "They stood out with their qualified technicians that have prerequisite product training, and the dealership was remarkable in ticking all the boxes for overall support in customer service." Located 40kms south of Brisbane, the Yatala facility opened in 2008 and only had to wait two years before it won its first Dealer of the Year award in 2010 and then backed it up with another win in 2011. "It’s been a good area here for DAF," Hurley says, pointing to successes with the CF85, tautliners, and rigid crane trucks during the past year. 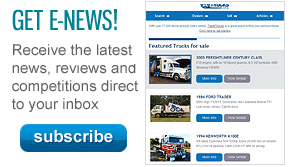 "The introduction of the LF trucks has been a real boon for our medium-duty metropolitan distributor customers." The year also held a high rate of returning customers for the dealership, reaching around 70 per cent of all new vehicle sales going to previous clients. "We had a really strong year back in 2010, so I guess it’s that five to six-year cycle of trucks needing to be replaced again," Hurley says. 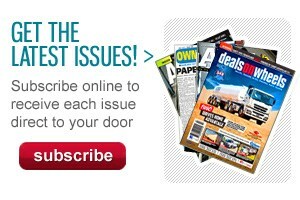 The long opening hours from the service team has also been attributed to the dealership’s win.